From the first, the angels were invoked in the Legion prayers. Every legionary, active and auxiliary, has a guardian angel who fights blow for blow at his side. In a sense that battle means more to the angel than to the legionary, for the angel perceives vividly the issues at stake: God’s glory and the value of the immortal soul. In addition, the entire angelic army hastens to the scene. For our battle is part of the main struggle which from the first they have maintained against Satan and his minions. An impressive place is assigned to the angels in both the Old and the New Testaments where there are several hundred references to them. They are represented as paralleling the human warfare and as having an intimate protective office in regard to men. They intervene at important junctures. The phrase constantly recurs: “God sent his angel.” All the nine choirs of angels have guardianship of some kind: over individuals, places, cities, countries; over nature; and some even over their fellow-angels. Scripture shows that even heathen kingdoms have their guardian angels. 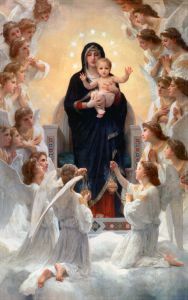 (Dan 4:10, 20, 10:13) The choirs are named as being: Angels, Archangels, Cherubim, Seraphim, Powers, Principalities, Thrones, Virtues and Dominations. The position is, accordingly, that the angels aid as a body as well as individually, playing a part analogous to that of an airforce in relation to a surface army. The memorial of the Guardian Angels occurs on 2 October.